Are you ready for all the holiday parties?! 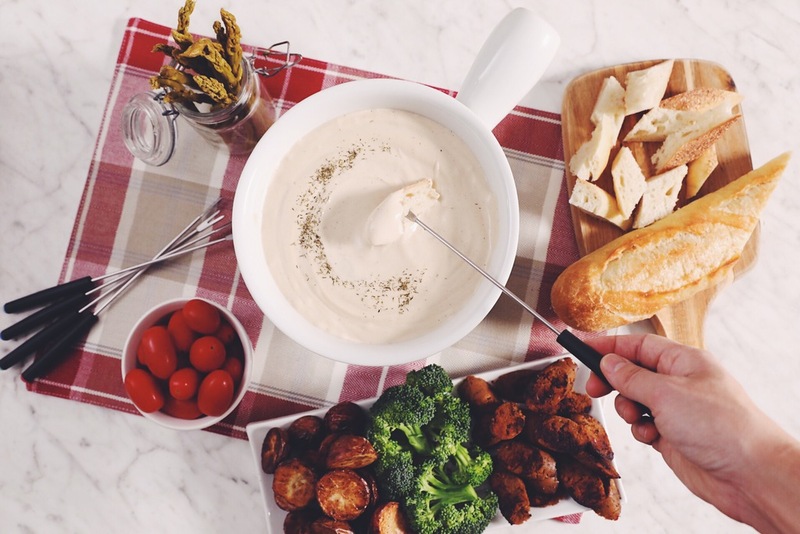 I wasn’t until I perfected the ultimate vegan beer cheese fondue. Yes! Fondue for the vegans. Let us rejoice! I think this is the best thing to bring to a potluck or party you’re going to or throwing this year. 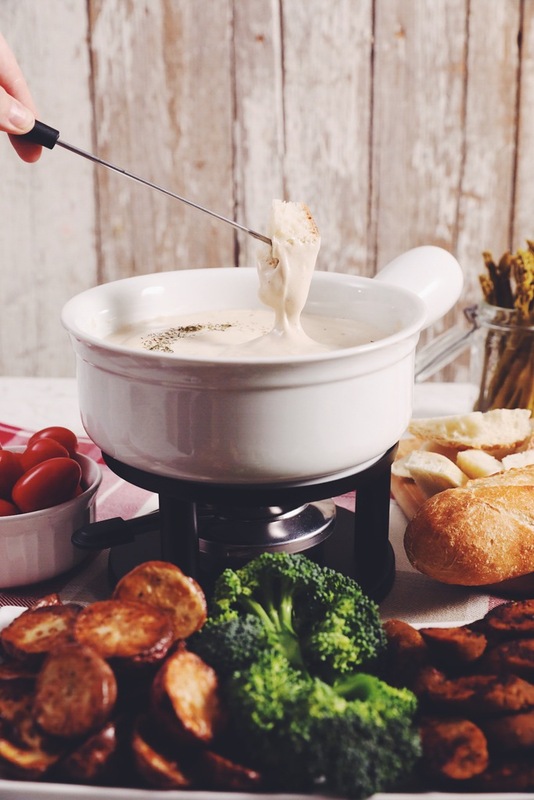 People will be blown away by the flavor in this fondue and won’t care that they aren’t devouring real cheese. In fact, after 5 bites they’ll probably give you a hug and thank you for it. The inexpensive fondue set even makes a cute gift for your party host too. It was a purchase at Hudson’s Bay this year and I’ve written a blog post on their blog, The Point, with even more cute foodie gift ideas you can check out here. This was all part of a video for easy vegan holiday bites that also includes a recipe for vegan cocktail meatballs with cranberry sweet & sour sauce which you can watch below… and then get writing your grocery list from the recipe below! Yes! Fondue for the vegans. Let us rejoice! In a large pan or cast iron skillet, heat olive oil over medium heat. Once hot, add onion and sauté for 2 to 3 minutes until soft and translucent. Add garlic, nutmeg, salt, and white pepper and sauté for another minute. Then add in potato and cook for 2 to 3 minutes. Add pale ale and bring to a simmer. Simmer for 10 minutes and potatoes should be fork tender. Add this mixture to a blender along with drained and rinsed cashews, sauerkraut brine, white wine vinegar, and dijon. Blend until very smooth. Pour into the fondue vessel at the table once the flame ignited and get fondu’ing! Pair with fresh baguette, raw broccoli, roasted potatoes, browned vegan sausage, apple slices, cherry tomatoes, pickled vegetables, or whatever you please! Lauren, do you have post where you list where to buy most of your ingredients? I’m in Canada, and your Amazon page is US, so do you have any grocers you recommend? I shop everywhere. No Frills has been the main go to as of late! hello Lauren, if I dont have the sauerkraut brine, with what other thing can I substitute it? Hoping to get a answer to Mariell question. Did you make your brine? Hello Lauren, is it enough for 4 person? And I don’t have sauerkraut brine, just sauerkraut juice does it also work for it? Why does the prep time on this say 13 hours? Am I missing something major? I just made this, and it was delicious! Followed the recipe exactly. Thank you for creating it! Can i leave out the ale/beer so then its kid friendly? it gets cooked out, but I would use club soda cause you need the air for the dough! My whole family (vegans and non-vegans) loved this recipe and have requested I make it again. Thanks for another great recipe! it just has a specific acid profile and taste. YOu can experiment with either of those yes, just haven’t tested it!